"You can't possibly be his mother..."
...just a comment I got from a complete stranger this weekend. Let me explain. Saturday morning Perry and I headed down to New Hope Middle School for the I Race because I Care run to benefit the Care Center. We love to support the Care Center and what it does for the less-resourced people in our community, and it was an absolutely spectacular day weather-wise, which made for a great morning. I just did the one mile fun run, since I had P in the jogging stroller. 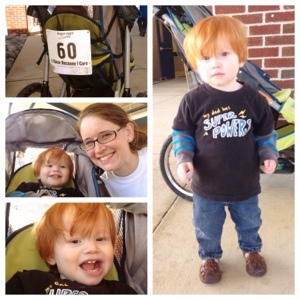 It was his first race and one of his first runs in the stroller...I really prefer to run without it. Perry did great and seemed to like the ride. 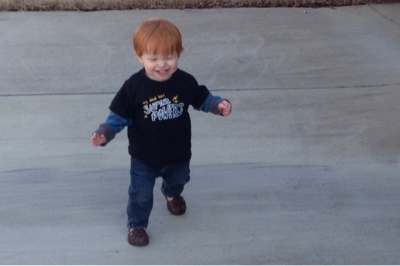 The race was superhero themed, so P had to wear his new "my dad has superpowers" t-shirt. He was also a big fan of the pizza, banana and powerade that was being distributed. We hung out there for a while (did I mention how pretty it was outside) and clapped for all the fast people get their awards. 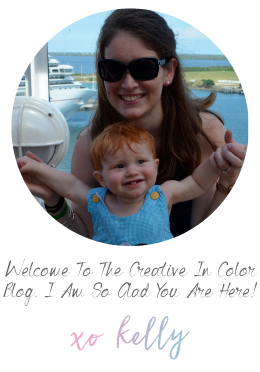 Complete strangers talk about P and his red hair everywhere we go. While we were at the run a sweet older people came up to talk to us and touch his red locks. We discussed briefly the rarity of the situation and the associated inheritance pattern. Then the lady paused and said "and you can't possibly be his mother." Thinking we were still talking about hair color, I responded "well actually my husband is not a red-head either, but we do have red-heads in both of our families." To which she responded, "no, I wasn't talking about his hair color...you cannot be old enough to be his mother..."
...that was unexpected. I'm not totally sure how I responded, but I think I said something to the effect of "thank you, but I am actually 28 years old" (and have been out of high school for 10 years now and have two college degrees). Bless her sweet heart, she made my day. Maybe I am hitting the age where it is a compliment for people to think I am younger than I am? But I am very proud to be this little man's mommy. After the run we ran by the grocery store and came home for an early nap, because someone had a date with the hair stylist later that afternoon. This was Perry's third haircut in his 14 month life. 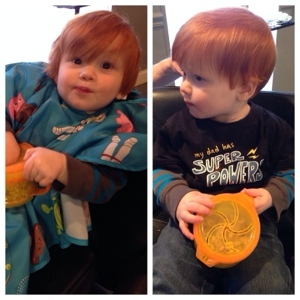 We had it cut just a little shorter this time...so maybe he won't get a shaggy mullet quite as quickly. Here is the before and after. Cheerios are a saving grace to keeping a toddler distracted. The rest of Saturday was spent playing outside. Perry was excited to get to run and play outdoors. We ended the day with a warm weather dinner of grilled hot dogs and baked beans. Travis and Gina came over for dinner and to drop off a furniture buffet we had ordered for our pantry renovation. Today was spent at church, and napping, and folding large piles of laundry. And trying to get a toddler to adjust to daylight savings time and an hour earlier bedtime.